Port Coquitlam, BC – At just 18-years-old, Campbell Stewart is already one of New Zealand’s most renowned cyclists. He has won four junior world titles in the past two years, the most by any New Zealand cyclist in history. He’s now racing within the elite ranks and it’s clear he belongs. Stewart finished first among a sprint of six riders to win the second annual PoCo Grand Prix presented by Dominion Lending Centres on Friday before a crowd of thousands in downtown Port Coquitlam. 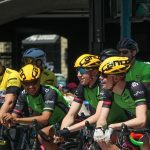 It’s become known around the BC Superweek events this week that Stewart’s Cycling New Zealand team is putting in a lot of hard work, including their training runs before each night’s race. Stewart admits that putting in the hard yards is by design. A cyclist with perhaps the coolest nickname was third as Ed “Real Deal” Veal sprint across the finish line behind Stewart and Knauer. A latecomer to the pro cycling scene, Veal only started road racing in 2006 at the age of 29. The Queensville, Ontario resident represented Canada in the Men’s four kilometre Team Pursuit at the 2015 Toronto Pan-Am Games, winning bronze. On April 10, 2015, Veal set the Canadian “Hour Record” at the Milton Velodrome, covering 47.59 kilometres in 60 minutes. In 2011, the now 40-year-old attended the Para Pan-Am Games where he rode tandem as the guide for Daniel Chalifour in visually impaired events and won a gold, a silver, and two bronze medals. In 2015, Shelley Olds put in a performance to remember with eight podiums and three straight wins at BC Superweek – plus a number of primes to total about $20,000 in prize money. 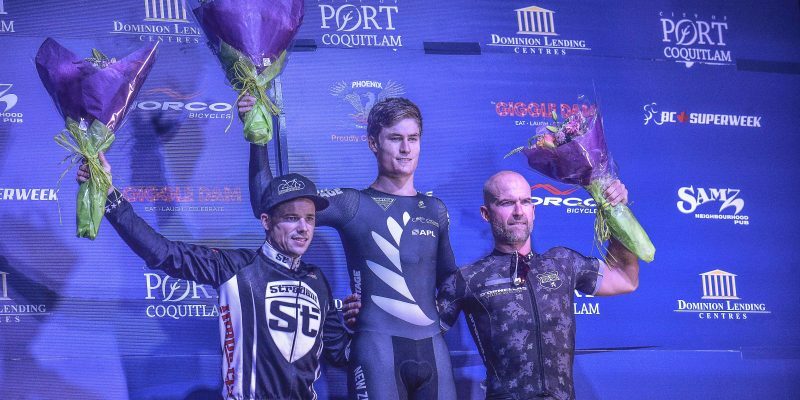 Fellow American rider Kendall Ryan is close to matching Olds’ BC Superweek record haul after a win on Friday at the second annual PoCo Grand Prix. The victory is Ryan’s third in the series this year after she was atop the podium in Sunday’s Tour de Delta White Spot | Delta Road Race and Wednesday’s Global Relay Gastown Grand Prix. The prize money alone totals more than $17,000. The 24-year-old from Team TIBCO-Silicon Valley Bank considers BC Superweek a tune up for the Prudential RideLondon Classique in a couple of weeks. It’s one of the reasons why she’s riding so well. “I’m just training hard and I’ve got a big UCI WorldTour race coming up in London, so I’m hoping to do well there,” said Ryan, who was born into a family of cyclists and began racing BMX at 6-years-old. 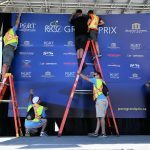 As for Friday’s PoCo Grand Prix, one of the more technical courses during BC Superweek saw a quick pace with very few lulls in the 40-lap, 52 kilometre race. A bunch sprint of 30 riders decided the winner in one hour, seven seconds. Ryan and her teammates Jennifer Tetrick and Madeleine Park found themselves tagged by some of the teams like Rise Racing and Fluevog’s Crit Nasty who had more riders in the race. Maggie Coles-Lyster, who rides for TaG Cycling Race Team, was as close to a hometown rider as there was in the PoCo Grand Prix’s 56-woman field. Coles-Lyster is from nearby Maple Ridge, which is just over 15 kilometres east of the city of Port Coquitlam. She’s raced at BC Superweek for a number of years, both as a young rider and in the women’s pro 1/2 races. The 18-year-old now has four top-10 finishes during the series this year. “Each race I’ve set these goals for myself. In Gastown it was eighth place and I got eighth. Yesterday (in Burnaby) it was fifth and today I said podium, and I got it!” a jubilant Coles-Lyster said. Coles-Lyster was aware of the damage Ryan could do, not only because of seeing what she’s done so far during BC Superweek, but also in reading the way Friday’s race unfolded. “I’d known from watching the prime laps that you had to get through that final corner first if you wanted the win, so that was my goal, just to jump right before and get through that corner. Kendall was just too quick on the outside,” explained Coles-Lyster. Holly Edmonston is riding at BC Superweek for Cycling New Zealand and acquitting herself quite well in Canada’s biggest cycling series. The third place finish in Port Coquitlam is her third podium appearance this week and fourth top-10 finish. 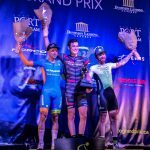 The 21-year-old track specialist won the Tour de Delta Ladner Criterium last Saturday, was third in Sunday’s White Spot | Delta Road Race, and ninth in Wednesday’s Global Relay Gastown Grand Prix. BC Superweek continues on Saturday with Steve Nash Fitness World presents Tour de White Rock Choices Markets Criterium. The women’s race starts at 5:30 pm and the men begin at 6:30 pm. If you would like more information about BC Superweek, please contact Brian Wiebe at 604-916-8448 or email at brian.wiebe@bcsuperweek.ca.